An innovative new work and personal development programme for people wanting to review progress and set new goals. Pretty much like yourself, this time last year I was a whole year younger! Whoever ‘they’ are, ‘they’ say that time passes quicker as we get older, and I will certainly vouch for that!………..which brings me on to Fresh Steps. When we were younger, how many of us set out to arrive where we now find ourselves? Not me, well not quite! We are probably where we are resulting from choices that we made quite some years ago when our circumstances and maybe our family and financial commitments were different. Apart from the obvious trend that we shall all probably be working longer than we perhaps anticipated, possibly through choice, or it may be that your pension is not quite what was expected, regardless of our age, as Yusaf Islam (nee Cat Stevens) once sang “You’re only dancing on this earth for a short while”, (Oh Very Young from Buddah and the Chocolate Box 1974). So, why not freshen our steps in both our personal and work life by reassessing priorities and setting goals towards achieving what we want to for the years ahead? For employers, how confident are you that you are optimising the potential of your employees, to what extent people may have been ‘pigeon holed’, written off, viewed as being jaded……….yet when they leave work, these same people have interests to which they commit themselves, utilise their knowledge and skills, have their dreams…….. In over 25 years of working with organisations, in my minds eye I can visualise dozens of such people, who, when given the opportunity at work to ‘freshen up’, to the amazement of the cynics and sceptics, flourished and achieved more than was thought possible – which is why employers are delighted with the positive ‘can do’ attitude of participants who have completed the programme. Knowing what success is – and acknowledging it! The person you are now – maybe ‘re-launching’ yourself! Making it happen – transforming goals into reality! 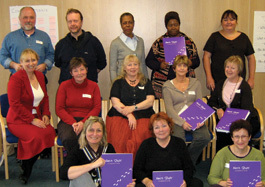 As each participant is unique and has their own goals, they vary from person to person. Some people choose to re-energise themselves in the workplace, perhaps learn a new skill or take a different direction, whilst others may focus on life outside work, pursuing a hobby, undertaking voluntary work, learning a life skill, getting and staying fit, growing vegetables……………. Whilst participants may not ‘dance’ (see above!) when they leave the programme, they do step away and into their work and personal future lightly!! For sure, participants walk away from Fresh Steps with a new spring in their step, open to new challenges and with a renewed sense of optimism and purpose. I have found the experience very motivating and it has given me the confidence to be able to do other things and go for qualifications to improve my skills." Was a very enjoyable, life learning experience, which has made me realise I’ve a lot more to offer and I’m not over the hill and ready for the scrap heap!"